These free indicators are included with a Jurik Tools installation onto the relevant charting platform. Each indicator utilizes, and thereby requires, one or more Jurik Tools to be properly installed. indicator are installed. Rightmost column shows which Jurik Tools are required for each indicator. Gap Awareness© is the ability to detect market gaps and eliminate all the ways they corrupt technical analysis. The result is stunningly accurate displays. Once you see it, you won't work without it. Price jumps occur in every market. Some are small while others are huge. We define gaps as discontinuous jumps in market price, large enough to produce serious distortions in classical technical analysis. We believe many gaps are “introduced” into the market just for this purpose: to degrade analysis. To counter that, all Jurik indicators for eSignal are “Gap Aware”©, which allows them to detect gaps in price data and remove its destructive influence from all calculations. There are two classes of indicators that can be affected by price gaps: those that plot over price bars (e.g. moving averages and price bands) and those that require their own display (e.g. index and oscillator plots). Within the first class, let’s examine moving averages. At right are shown four filters available in eSignal 12.7. Note how they react to a price gap. Some under-react and require time to catch up to price, while others over-react and need time to retrace back down to price. In contrast, our JMA filter, with Gap Awareness enabled, jumps with price and continues filtering without these side effects. JMA handles gaps by adjusting its filter speed to be very fast at the critical moment. As an added feature for eSignal users, when any Jurik indicator detects a gap, it will automatically black out during the jump in order to indicate gap detection. We next examine how bands are affected. 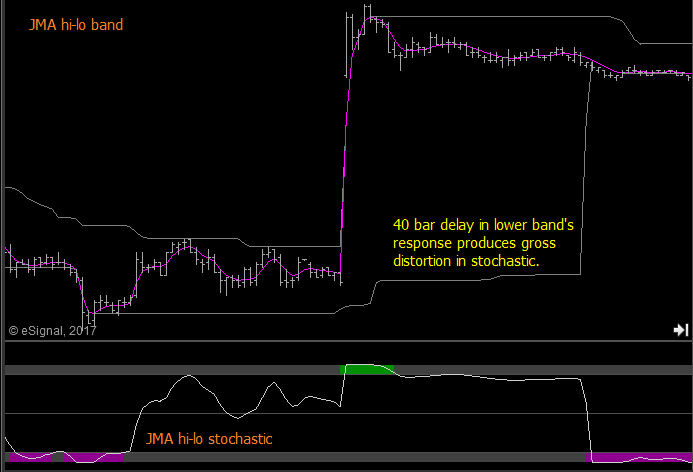 Bands fence in price bars from above and below and consequently can also be distorted by market gaps. In addition, stochastic oscillators derived from such affected bands will suffer distortions as well. The left image below shows two indicators with Gap Awareness© disabled. The top portion shows Jurik's SPX band and JMA on price. 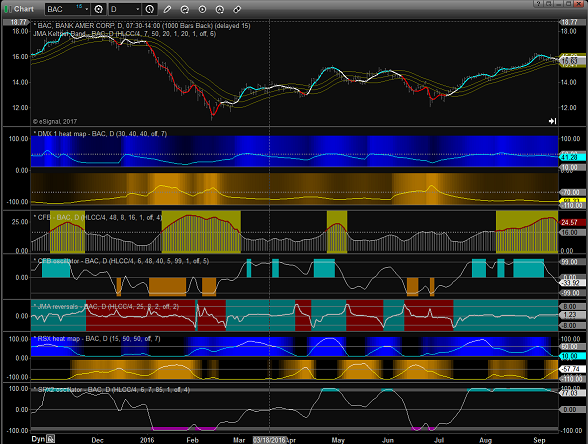 The bottom portion shows the SPX stochastic oscillator derived from the relative location of JMA within the SPX band. After the upward gap, price appears to wander within the band causing it to not be classified as either trending up (blue) or down (red). The right image below has Gap Awareness© enabled. Both JMA and SPX band shift up with price, maintaining their stochastic relationship, thereby preserving the stochastic oscillator during the market jump. Consequently, the downward action of price is now correctly classified as downtrend (red). When made Gap Aware©, the SPX oscillator showed this market as oversold. The chart at right confirms this assessment, as we see price rising afterwards from the oversold region. Without this new technology, opportunities like these could go undetected. Another example of gap induced distortions is shown below. It employs a popular price band, the highest and lowest value of price over the last N bars. Here we see that band applied to JMA on price, and N = 40 bars. The market gap pushed the upper band higher while the lower band must wait 40 bars before it can rise as well. This delay forces a stochastic (relative location of JMA within the band) to produce very large positive values for the next 40 bars, even though price is actually falling. In contrast, the chart below shows when the hi-lo band is made Gap Aware©, its width is retained during the jump, avoiding distortion and allowing the stochastic to produce correct values. The "oscillator" class of technical indicators can also be affected by jumps in the market. This class includes RSX, VEL, DMX, and CFB. The image below shows two VEL plots with our gap detection feature disabled in the first one, and enabled in the second. Note how the top VEL reacts to the market jump while the second VEL remains unaffected. The same before/after comparison can be made with CFB. In the chart below, we see Gap Awareness© clearly avoided unwanted distortion. Price jumps occur in every market. Some are small while others are huge. We believe many gaps are “introduced” into the market on purpose. Classic technical analysis tools handle them poorly because their math assumes changes in market price have a Normal (Gaussian) distribution. In reality, market behavior is anything but Normal. When price jumps occur, classic formulas will likely produce distorted results, degrading your technical analysis. 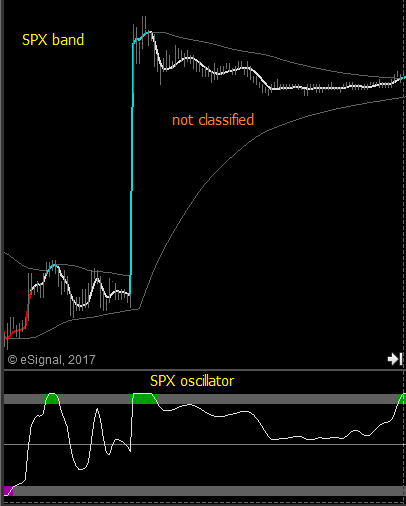 To counter that, all Jurik indicators for eSignal are “Gap Aware”©, which allows them to detect jumps in price data and remove its destructive influence from all calculations. In order to assist with with your own before/after comparisons, you are given the option to disable this feature in each Jurik indicator for eSignal. Jurik Toolset for eSignal includes all indicators listed below. CFB heat map Plots CFB and related heat map..
CFB dyna band Plots a dynamically expanding/contracting band around price. JMA line is colored to indicate bull/bear market. Band size is modulated by CFB. 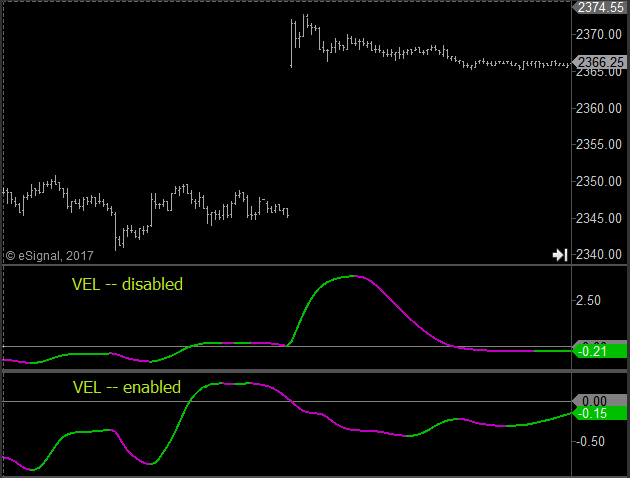 CFB Oscillator Converts "CFB dyna Band" to a stochastic oscillator, useful for generating trade signals. CFB Spectrum Plots all four CFB lines for immediate comparison. DMX-1 Jurik's original DMX, an improved version of the classic DMI. DMX-2 Jurik's new DMX, using a simpler and more robust algorithm. DMX heat maps Area color intensity displays DMX strength. Visually stunning. EXI Price Excursion Index. Quantifies short term market moves. JMA Jurik's ground breaking, nonlinear, self-adjusting moving average. JMA + trailing MA Plots JMA and a trailing moving average of your choice ( EMA, DEMA, TEMA, MMF, Bessel, Butterworth ). oscillator Uses the "JMA + trailing MA" indicator to form a MACD-like difference oscillator. JMA CCX Jurik's version of the classic CCI indicator. Fast with less noise. JMA hi-lo band Plots Jurik's SPX band around JMA on price. 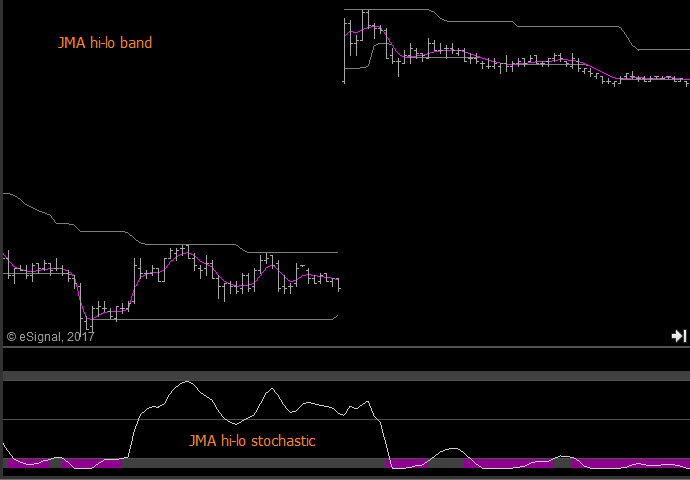 JMA hi-lo stochastic Converts "JMA hi-lo band" indicator to a stochastic oscillator. JMA Keltner Band The classic Keltner Band modified by using JMA in key calculations. MFF line Jurik's new "Maximally Flat Filter". Great for assessing long term trend. MFF Band Plots Jurik's SPX band around MFF on price. RSX Jurik's version of the classic RSI. Fast with less noise. RSX heat maps Area color intensity displays strength of RSX+ and RSX-. RSX on JMA RSX applied to price pre-smoothed by JMA. Larger dynamic range. RSX on RSX RSX applied to another RSX. Especially good on markets reversing in a tight trading range. SPX Band Jurik's price band that reflects market's fading exponential memory. 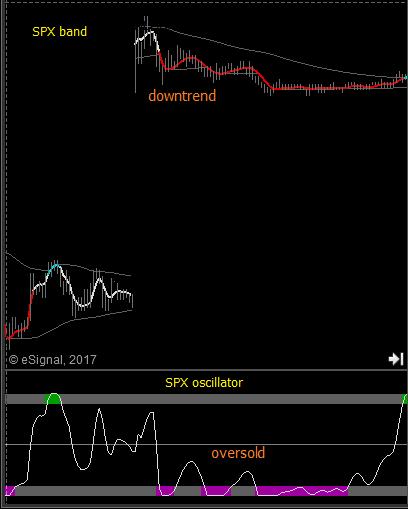 SPX Oscillator Converts SPX Band into a stochastic oscillator. VEL Jurik's version of the classic momentum (MOM) indicator. A very smooth Fast-K stochastic. The difference between two JMA, having same speed but different phase. Jurik's own band around price bars. Plots Jurik's CFB in a pane under the price chart. Jurik Toolset for NinjaTrader 8 includes all indicators listed below. Graphic CCX Jurik's improved version of the classic CCI indicator. 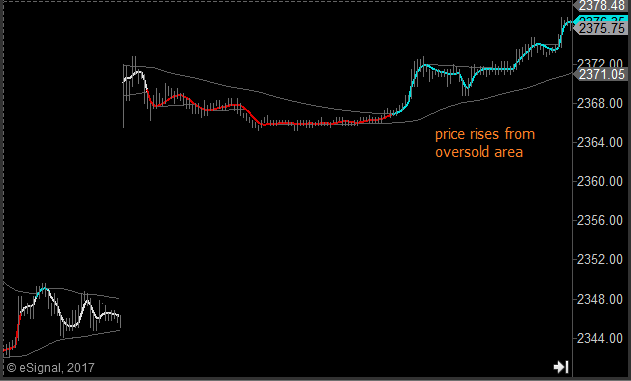 Graphic CFB Jurik's improved version of the classic ADX indicator. Graphic CFB group Color display superimposing all four CFB indicators. Graphic CFB heat map CFB indicator with background heat map. Graphic CFB dyna band Price band with CFB controlling dynamic width. Graphic DMX Jurik's improved version of the classic DMI indicator. Graphic DMX plus/minus Components to DMX. Analogous to the DMI+ and DMI- components of the classic DMI. Graphic DMX reversals DMX with special band to designate market reversals. Graphic DMX heat maps DMX+ and DMX- indicators with background heat maps. 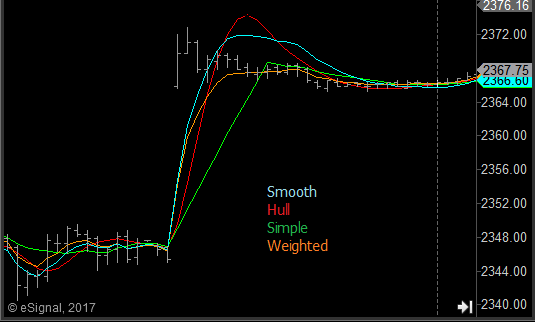 Graphic DWMA Plots a double-weighted moving average (DWMA) on price bars. Graphic JMA Plots the popular JMA (Jurik Moving Average) over price bars. Graphic JMA double Stoch A very smooth Fast-K double stochastic. Sensitive to market acceleration and deceleration. Graphic JMA / DWMA crossover Plots JMA and a double-weighted moving average (DWMA) on price bars. Useful for crossover analysis. Graphic JMA / T3 crossover Plots JMA and Tillson's T3 moving average on price bars. Useful for crossover analysis. 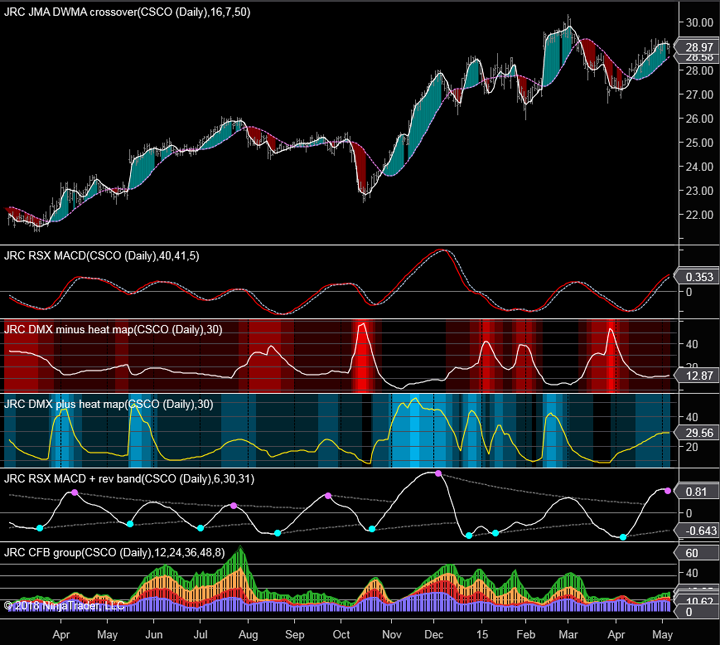 Graphic JMA DWMA MACD A MACD-like oscillator measuring the distance between a fast JMA and slow DWMA on price. Useful for momentum analysis. Graphic JMA MACD reversals JMA MACD with special band to designate market reversals. Graphic JMA Keltner Band The classic Keltner Band with JMA crossing in and out of the band. Graphic RSX Jurik's improved version of the classic RSX indicator. Applies RSX onto another RSX. Good for tracking market reversals in a congested trading range. Graphic RSX on JMA Plots RSX on price that has been pre-smoothed by JMA. This changes RSX dynamics. Graphic RSX for scalping Unique application of RSX for detecting scalping opportunities. A MACD-like oscillator measuring the distance between fast and slow RSX functions. Graphic RSX MACD reversals RSX MACD with special band to designate market reversals. Graphic T3 waterfall A spread of T3 curves yielding insightful price behavior patterns. Graphic VEL Jurik's improved version of the classic MOM indicator. Graphic VEL MACD A MACD-like oscillator measuring the distance between fast and slow VEL functions. Graphic VEL for scalping Unique application of VEL for detecting scalping opportunities. Graphic Volatility heat map Market volatility index with background heat map. Jurik Toolset for Sierra Chart includes all indicators listed below. 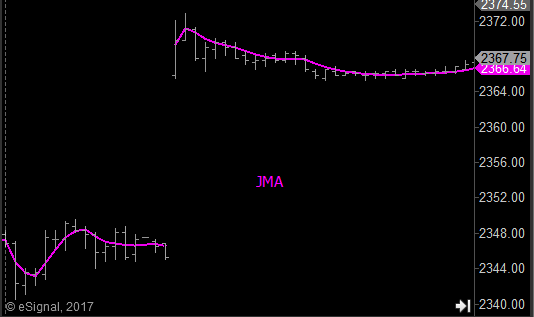 Graphic JMA Jurik's latest moving average with an improved gap response over AMA. Graphic JMA Fast-K A JMA-based stochastic that replaces all four classical stochastics: Fast %K, Slow %K, Fast %D, Slow %D. To differentiate between them, all you need to do is change JMA's length parameter. Graphic JMA dStoch A very smooth Fast-K double stochastic, sensitive to market acceleration and deceleration. Graphic JMA CCX Jurik's version of the classic CCI indicator. Very smooth and timely. Graphic JMA DWMA xover Plots JMA and a double-weighted moving average (DWMA) for crossover analysis. Graphic JMA Keltner Band The classic Keltner Band modified by using JMA in key calculations. Graphic DMX Plots Jurik's DMX in a pane under the price chart. Graphic RSX Jurik's version of the classic RSI with dynamic speed control. The faster the market, the more quickly RSX changes values. This way, RSX grabs your attention only when the market requires your close observation. The indicator calculates a new speed for RSX on each bar. Output Range: -100 to +100. Graphic RSX on RSX Plots a user defined blend of standard RSX and a special series where a the result of the first RSX is processed by another RSX. Especially good on markets reversing in a tight trading range. Output Range: -100 to +100. Graphic RSX on JMA This indicator is identical to indicator RSX, except that price data is pre-smoothed by JMA. Doing so extends the range of RSX and produces fewer micro reversals. That lends itself to advanced analysis. Output Range: -100 to +100. Graphic VEL Jurik's smooth version of the classic momentum indicator. Includes an option to normalize scale, which produces a plot whose overall scale is same across all markets. Graphic VEL on VEL Plots a user defined blend of standard VEL and a special series where a the result of the first VEL is processed by another VEL. Especially good on markets reversing in a tight trading range. Output Range: -1.5 to +1.5. Graphic CFB 24, 48, 96, 192 Plots CFB calculated on most recent (24, 48, 96 or 192) bars. Graphic CFB chan plot Plots a dynamically expanding/contracting band around price. Band size is modulated by CFB. 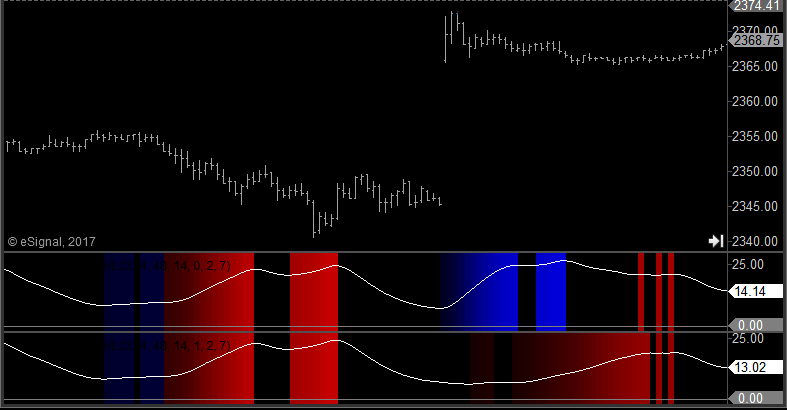 Graphic CFB chan index Converts "CFB chan plot" to an oscillator, useful for generating trade signals. Graphic CFB dyna band Plots a dynamically expanding/contracting band around price. JMA line is colored to indicate bull/bear market. Band size is modulated by CFB. 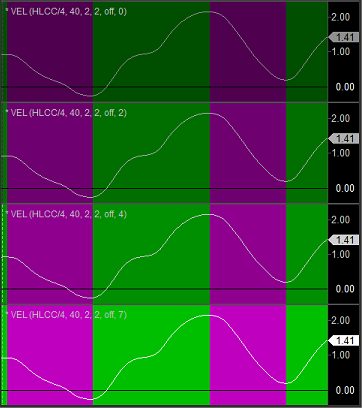 Graphic CFB dyna Osc Converts "CFB dyna Band" to an oscillator, useful for generating trade signals. Graphic CFB dyna RSX Plots RSX with dynamic speed controlled by CFB. During market reversals, CFB makes RSX move faster, and thus more timely.